From a uterus with boxing gloves to mesmerizing constellations to a hot dog bus doling out NYC iconic treats, 2018 had us reimagining public art. This year’s immersive art demonstrated how public art can create new spaces that encourage accessibility, gathering and healing. There were so many impressive site-specific projects around the world that it was hard to limit our list of favorites. We want to celebrate all artists that are using the public sphere to create dialogue and invoke change. With that said, here are some public art installations that struck us with their pervasive theme of “Collective” whether that be through the audience’s experience or in the use of multiples in the work. CNN claimed that 2018 would be the “year of women” and indeed throughout the year we heard many voices supporting women’s rights. Female artists amplified that chorus, including the work of British artist, Zoe Buckman. We are inspired by Zoe's first-ever public art installation, Champ, in Los Angeles. It is a 43-foot tall kinetic neon abstracted uterus. Instead of ovaries, it has fiberglass boxing gloves. Unless, curated and produced by Now + There, explores sustainability, climate justice and how taking action together can create positive change. Stephanie’s vibrant orange floor-to-ceiling installation fills the main entryway of Boston’s landmark shopping mall, Prudential Center. This monumental, temporary artwork is a patchwork tapestry of upcycled construction debris netting that serves as a call to contemplate climate change. Sourced from local worksites, the netting is embroidered with phrases from the Pope's Encyclical on climate change, suggesting care for the environment is care for the poor who are most affected by global warming. Unless gets our vote not only because of its bright aesthetic and bold statement on climate change, but also because of its intentional and accessible programming. This includes a panel on environmental responsibility as well as a workshop in which participants made their own upcycled tote bags. Memorials typically depict their subjects’ lifelike qualities in bronze. 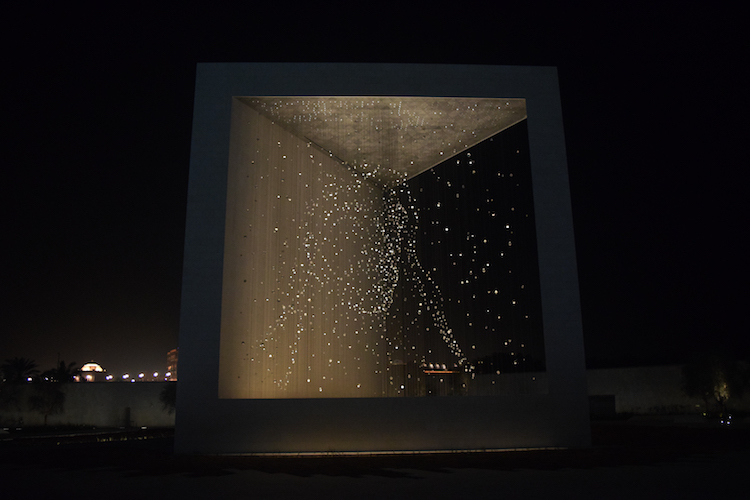 Ralph Helmick challenged himself to create a new kind of portrait for The Founder’s Memorial Park in Abu Dhabi, which pays tribute to the late Sheikh Zayed bin Sultan Al Nahyan. The UAE’s founding father was a transformative leader who championed peace, tolerance, women’s rights and the environment. His likeness is ubiquitous in UAE so Ralph decided to create an abstracted portrait inspired by Sheikh Zayed’s lifelong devotion to nature. The artist’s celestial display consists of 1,327 geometric shapes attached to 1,110 cables. The suspended polyhedrons shine like stars in the night sky, and evoke the timelessness of Sheikh Zayeh’s enduring vision. The Boston-based sculptor collaborated with Dpa Lighting and Stage One (UK) fabricators to bring his work to life in the heart of the memorial. Shimon depicted 12 of these friends that were granted asylum in the United States in a 10-minute silent film projected from a barge that floats down New York City’s waterways. The work was commissioned by More Art, a Manhattan-based socially conscious nonprofit that specializes in public art projects, and drew on the collaboration of community empowerment groups and legal aid organizations, such as Immigration Equality and Safe Passage Project. Design is not just about aesthetics; it can improve our quality of life. Smog Free Tower is a great example of an outdoor sculpture that makes a positive impact on our environment. Studio Roosegaarde created a 23-foot tall air cleanser that purifies over 1 million cubic feet of air per hour! And it does this on as much energy as a water boiler. The tower shares an optimistic vision of a cleaner future. Photo by Morris Malakoff, The CKP Group. 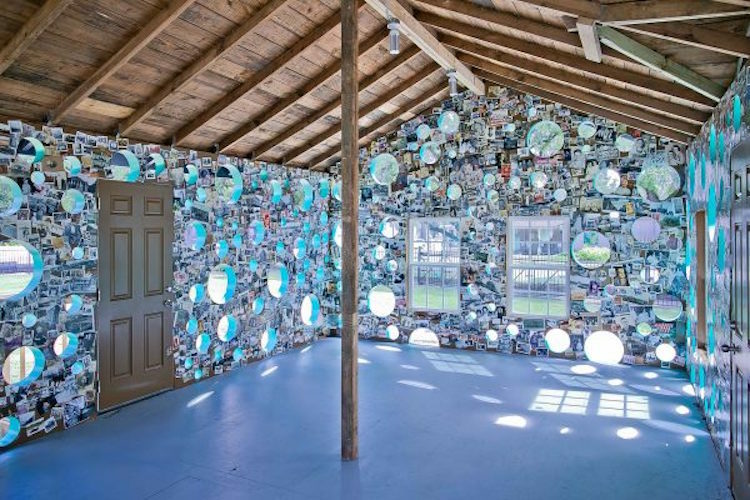 Houston-based artists, Dan Havel and Dean Ruck, transformed an abandoned home into a perforated play on public history. By cutting large round holes into a home and wallpapering the walls with historic images, they commented on the layering of history. Dan and Dean wanted visitors to walk through the house and be able to view both the modern skyscrapers of Houston alongside images from the city’s past. Open House was sited in Sam Houston Park, a space that includes other historic homes like that of Jack Yates, a freed slave who became pastor of Houston’s first African-American church. How can you not love a bus shaped as a hot dog?! 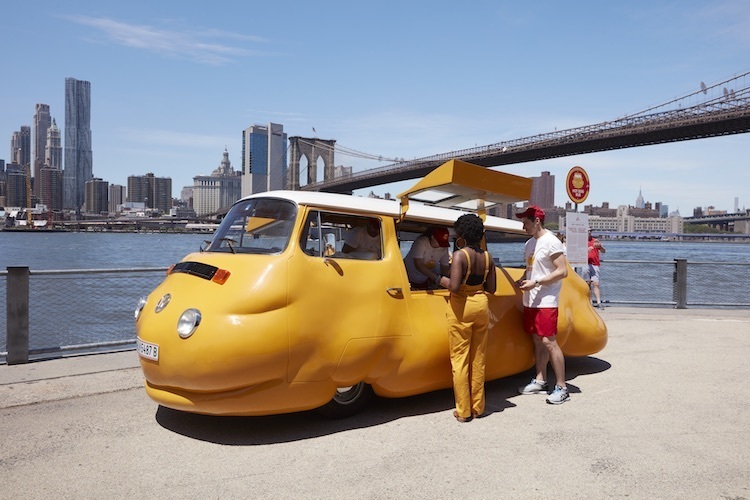 Austrian artist Erwin Wurm transformed a vintage Volkswagen Microbus into a bright yellow food truck that blurs the boundaries between artwork and audience by handing out free hot dogs. Someone may not be comfortable walking into an art gallery in SoHo, but they’ll probably grab a free snack—leading to a comfortable exchange between performer and participant. This absurd, yet approachable project engages new publics and challenges the definition of art. Can a hot dog bus be sculpture? Is snacking on a free hot dog participating in the creative process? Wurm would say, "Yes." The work also encourages us to think about the relationship between food and art. Wurm plays with the concept of “building”—the act of modeling a statue in clay, increasing the volume of the bus, and eating, which adds mass to our own bodies. If you look up while walking along one of the busiest roads in London you’ll spot a traditional Korean house that seemingly dropped on top of a footbridge. Slightly askew, Do Hu Suh’s large-scale installation echoes the artist’s own experience of shifting between continents and cultures. The piece continues his career-long investigation of memory, migration and the immigrant experience. Last year we fell for another house project—Matthew Mazzotta’s Cloud House. “You are stronger and smarter than your realize” is just one of hundreds of simple yet profound pieces of advice that artist Susan O’Malley collection from people aged 7 to 88 for her project Advice from My 80-Year-Old Self. O’Malley asked individuals to consider what words of wisdom they would pass on to their younger selves. The resulting collection features powerful statements of affirmation and perseverance, humor and reminder to be present and appreciative of every moment. Presented as bold graphic posters, these phrases reflect the positivity and desire to create authentic connections between strangethers that characterizes Susan’s artistic practice. The installation is part of San Diego Airport’s Figure of Speech exhibit that features 16 exhibitors whose artwork and collections explore the complexity, history and beauty of language. Studio Drift’s flying sculpture of 300 luminous bird-like drones in swarming formation made its first debut at Art Basel Miami Beach in 2017. It made another appearance in 2018 above the River IJ in the duo’s home city—Amsterdam. Lonneke Gordijn and Ralph Nauta, the artists behind Studio Drift, have been fascinated by the clustered flight patterns of starlings for years. After studying the swarming technique for a decade they developed an algorithm that can make autonomous choices. 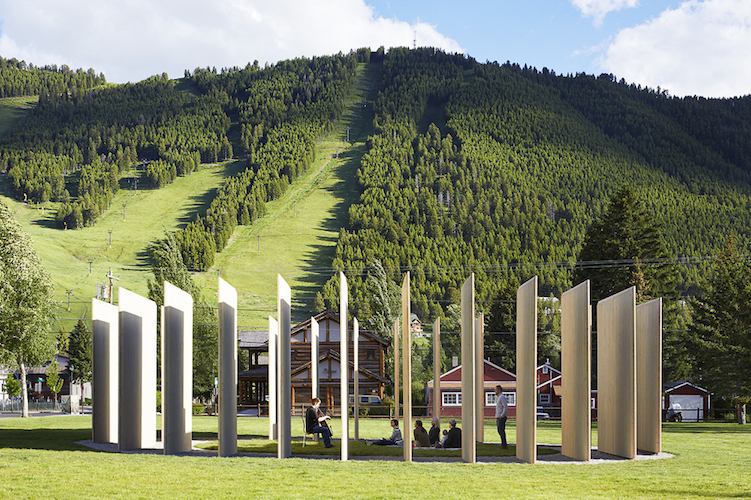 Inspired by Jackson Hole’s majestic landscape, Carney Logan Burke Architects designed Town Enclosure, a temporary public art project with a minimal material footprint. Town Enclosure is inspired by western corrals and contemporary sculptors like Richard Serra. It is both a sculpture and an accessible gathering space that welcomes informal and programmed performing events. Its design is elegant in its simplicity. The timber panels sourced from sustainably managed forests are angled and spaced out to create a space that is simultaneously open and closed, which encourages movement through and around the sculpture. To be sustainable, no concrete was used at all. The foundation is made of reusable steel covered by a gravel field, which when removed will only require a small bit of sod for restoration. Curious to see what dazzled us last year? Check out Public Art Projects that Wowed in 2017! Prepare your art collection for the unexpected. Can an Art Consultant Help Protect Your Collection? You’ve spent a lot of time and resources building up your collection. Do you actually need someone else to help protect your collection?